1978 tour Being new means no preconceptions. With Simple Minds, I had no real idea of what to expect. There were promises of 'a great band' from those who'd seen it all before, but there was still no accurate description of them. I'm not too sure this will be one either. Three days and some hours after their set, I'm still lost for the proper words, except, they are 'a great band'. On that one gig, I've seen more excellence, more potential, more sheer goodness, than I've seen in any unsigned (and most signed) bands, since the early (not so-distant) rumblings of the new wave. Simple Minds are six; Jim Kerr (vocals), Charlie Burchill (guitar and violin), Mick MacNeil (keyboards), Duncan Barnwell (guitar), Derek Forbes (bass) and Brian McGee (drums), plus David Henderson on 'sounds and ideas'. 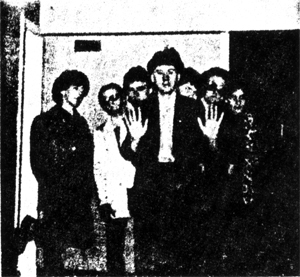 Three ( Jim, Charlie and Brian) are from the remains of Johnny And The Self Abusers and Derek is from The Subhumans. They're played as a 6-piece for four months, developing the best of last year's material alongside their new songs. And you can't see the joins. It's where to begin that's hard. With six, the sound is completely full, but the group are careful not to be simply heavy, but to use each instrument to its best. On Take Me To The Angels, the introduction and the first verse power on, but suddenly an extra surge comes through, lifting an already great song. Take Me To The Angels, is probably their most commercial (in singles terms) song. Like all their set, it's long-ish and not immmediate in terms of remembering each note or word as soon as it's finished. Each song takes its time. They're built on riffs; riffs, which (like The Beatles She's So Heavy ), you never want to end, that chop and cut throughout the song, under vocals or some excellent solo, sometimes twin, lead guitar. The songs, be it Sweet Things, Tonight, You Better Watch Out, leave an impression, an effect rather than a series of notes. The next time round, words and notes begin to stay in the mind as well as the atmosphere. It's hard to find parallels. There's a song called Chelsea Girl (an original) and there The Velvet Underground spring to mind. But it's more by word-association rather than music, although Simple Minds paly amongst the same uneasy felling of Lou Reed's early work. Television too, but the acidy 60's influence which covers Tom Verlaine isn't there in Simple Minds who's music is very much the nineteen seventies, with much more power and fullness. The last two songs are stunning. Murder Story begings with an intro similar to Final Solution (still the best Pere Ubu), tense and cranking before disappearing into something else again; another relentless, fabulous song. Pleasantly Disturbed closes, and like Chelsea Girl is slow, almost menacing and completely great. I guess the secret is those marvellous riffs, simple but completely effective, and the way they swap and change inside each song. What is exciting are the possibilities. With so many groups caught in the blindness of their own making, simply recreating what made them good, Simple Minds have endless choice. To be excellent and have potential is no mean thing. Simple Minds are a great band.